A crown is a type of dental restoration, which completely caps or encircles a tooth. Crown is indicated to restore a broken or damaged tooth or safeguard Root Canal treated teeth. They are typically bonded to the tooth using dental cement. A Bridge is a dental restoration used to replace a single or multiple missing teeth by joining permanently to adjacent teeth. A Crown or a bridge is either made up of Ceramo Metal, Zirconia, or an all Ceramic material depending on the given situation, to match the requirement of function and aesthetics. These are fabricated using the modern Cad/ Cam technology or Metal Laser Sintering to provide for a precise fit and come with a warranty of upto 15* years. At Dr Shwethas Dental & Implant Centre, one can choose from the conventional Ceramo-metal to the very esthetic, all Ceramic/ Zirconia core Ceramic crowns crafted to bear strikingly close resemblance to natural teeth!!! Indications: Restoration of Endodontic treated (root canal) teeth, Fractured or missing teeth, Full Mouth Restorations and Rehabilitation for worn down, dilapidated teeth. When is a Crown or Bridge indicated? A Crown is indicated to restore a broken or damaged tooth or safeguard Root Canal treated teeth. A Bridge is indicated to replace a missing tooth / teeth by crowning or support from adjacent teeth. Is there much discomfort during or after crown and bridge procedures? With modern local anesthetics, there is virtually no pain during the procedures. The patient can expect some slight discomfort after visits similar to that following a visit for simple restorative dentistry (“fillings”). How long will I be in the chair? How many visits can I expect? Before proceeding with your crown and bridgework, you will receive a “Sequence of Treatment” which outlines the number of visits, the length of time for each visit, and the number of weeks required for total treatment. This depends on the kind of restoration required and the existing bite of the patient. Will I be without teeth at any time during the treatment? No, at no time between visits will you be without teeth or aesthetically compromised. Temporary crown and bridgework made of a durable aesthetic plastic will be placed immediately to allow normal functioning and aesthetics until the permanent work is completed. What are the different types of materials available? A crown or bridge can be made up of Ceramic using either Metal, Zirconia, or an Lithium Disilicate material depending on the requirement of function and aesthetics. These are fabricated by casting or pressing procedure or alternatively the most advanced & precise CAD-CAM technology which comes with a limited warranty from the Company of 10 to 15 years. The cost differs according to the material used and the fabrication procedures and also the number of teeth involved. So, contact us at Dr. Shwethas Dental and Implant Centre for an instant quote for your restoration. Dentures are a conventional, age old, tried and tested method of replacing missing teeth for the geriatric patients. 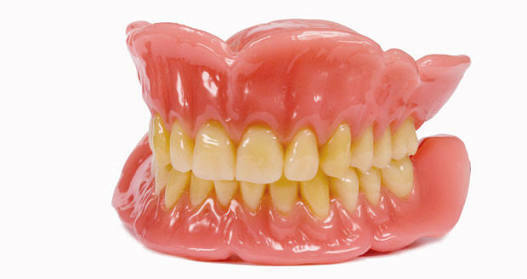 Having complete dentures helps with chewing as well as supporting one's facial structure and improving ones speech. With immediate dentures, you can have a full set of teeth while you are waiting for your gums to heal and your bone to realign after having teeth removed. So, immediate dentures are a great alternative during that time. Conventional dentures are removable, however there are many different denture designs, some which rely on bonding or clasping onto teeth or are fixed over implants. Dentures require constant maintenance with soft relining every 2 to 3 years. Your gum tissue and jaw bone shrink with time. This causes the denture to become loose resulting in a poor fit. A visit to your dentist for an oral health examination will determine the cause of your ill- fitting dentures. Take a consult on how to improve the fit off your ill fitting denture with implant support. Indications: Removable or Implant supported Denture, for the Senior Citizens who want to enjoy life to the fullest! There is not a removable prosthesis made for the mouth that is permanent. The mouth is constantly changing. On average a partial or a full denture may be expected to last about 5 years. If your dentures are over 5 years old and if they have not been relined every 2/3 years you probably will have some problems with the fit of your dentures. Your gum tissue and jaw bone shrink with time. This causes the denture to become loose resulting in a poor fit. A visit to your denturist for an oral health examination will determine the cause of your ill-fitting dentures. What is the treatment for ill-fitting dentures due to lack of bone support? With advancing age & gum disease the jawbone shrinks and therefore dentures especially in the lower arch become unstable. The best way to treat these situations is by providing 2 to 4 implants, which can provide an attachment for the denture to grip on. Some parts of the implants may need replacing with time because of wear or deterioration. Porcelain veneers commonly used as a treatment modality for Smile Enhancement are thin shells of ceramic that are bonded to the teeth in order to change the color, tooth position, form or shape and enhance the smile with an aesthetic appearance. They provide strength and resilience, which is comparable to natural tooth enamel. In the first appointment, a study model is prepared. The study model is used to make a wax up or mock up to give the patient an idea of the final outcome, which is decided by our aesthetic dentist using, the principles of digital smile design. In the second appointment, after minimal preparation of the teeth, impressions are made. Temporary restorations are fabricated immediately. In the next appointment a trial of the veneers is done, to check the aesthetics and they are subsequently bonded to the tooth to provide the required Cosmetic change. One sitting Composite veneers or Luminaires option is also available. However these have a limited life span and are recommended, for a quick fix. Ceramic veneers are generally preferred as a more permanent and aesthetic option! Indications: To improve shape, size, color, or position of teeth, To enhance your smile. Can I do a porcelain veneers for my chipped & crooked teeth? If you do have missing or broken teeth that you would like repaired, dental crowns are available to treat these problems. Crowns cover and encase the entire tooth, while a porcelain veneer strictly covers the front side of the tooth that shows when a person smiles. Dental crowns and porcelain veneers are also different because of their relative thickness. Because porcelain veneers are thin and cover less of the tooth surface, they require less re-shaping of the tooth than a crown, thereby conserving more of your natural tooth structure. They are hence sometimes referred to as minimal or no preparation restorations, ‘Thinneers’. What are the different materials for a Tooth Veneer? Dental Veneers can be made using Composite resin or Ceramic. When Composite Resin is used as a veneering material it is done as a direct - chair procedure– for build up & shaping in the mouth. However with Ceramic, preparing the teeth for veneers is followed by impressions and fabrication in the dental laboratory. These are then permanently cemented using resin cement. Therefore this is a two-stage procedure. Composite Resin veneers over a period of time can discolor or chip and may need maintenance or periodic redoing. However, Ceramic veneers are resistant to staining and are a permanent option. How long can I expect the ceramic veneer to last and what precautions do I undertake? 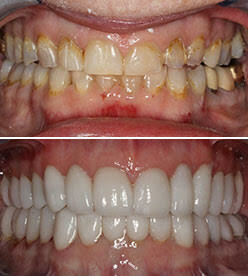 Ceramic veneers offer a permanent solution. With regular oral hygiene maintenance and dental checkups, your ceramic veneers will remain as good as new. Although the veneer is a thin shell of ceramic, once bonded with the tooth, it forms a single entity with the underlying tooth structure. Depending on the material of the veneers, the time & costs vary. Composite resin Veneers done chairside are an immediate fix but Ceramic veneers taken about 4-7 days for fabrication at the laboratory followed by trial & then cementation. Initially a wax up is prepared & a mock transfer is done in the mouth to indicate the degree of aesthetic correction. To find out more call us at Dr Shwethas Dental & Implant Centre. What are Lumineers, how are they different from Veneers? Lumineers are minimal or no preparation veneers of a particular brand of porcelain that can be fitted to your existing teeth without much or no grinding. Hence these are indicated only in situations where there is very minimal correction of teeth that is required. As they are very thin there is limitation to the aesthetic outcome and often the junction between the lumineer & natural tooth may be difficult to mask. To know what works best for your smile, a consult for a digital set up & wax up helps the Dentist determine the indication. They are prefabricated veneer shells made of reinforced composite resin and can be directly glued on to the tooth enamel. They are available in different shapes and shades to customize according to the patients requirements and can be fitted with minimal or no preparation of the teeth. Componeers as compared to veneers have a limited life and are indicated for a quick fix situation where a single visit to the dentist is all that is needed for a brighter and whiter smile...! Full mouth rehabilitation (or full mouth reconstruction) is a dental treatment, which includes restoration and/or replacement of all or most of the damaged and missing teeth by means of artificial restorations. It is a complex inter-disciplinary treatment, which requires advanced planning, designing, and execution. Numerous broken, lost and diseased teeth almost always negatively impacts patient’s social interaction, well-being and quality of life. The goals of full mouth reconstruction include improvement of the above aspects of one’s life. Full mouth rehabilitation (or full mouth reconstruction) is a dental treatment which includes restoration and/or replacement of all or most of the teeth by means of artificial restorations. It is done in order to restore the debilitated bite. It is a complex inter-disciplinary treatment, which requires advanced planning, designing and execution. The treatment plan is customized according to each patient’s requirements. Overall the treatment is typically divided in several stages. In the initial planning stage, the dentist evaluates the condition of the mouth taking into consideration the patients desires, and cost requirements. A series of impressions are made for study models as well as intraoral photographs are taken to zero in on an ideal treatment plan. A wax up is made to give the patient an approximate estimation of the final treatment outcome. In the active treatment stage necessary procedures are performed. The patient is maintained on a set of temporary crowns for a period of 4 to 6 weeks so that the patient is used to the new rehabilitated bite. Once the patient has adjusted to the new bite, rest of the procedure is completed with permanent restorations. In the maintenance phase, patient is recalled for six monthly or annual clean ups and checkups. Treatment time of full mouth rehabilitation depends on the patient’s clinical condition and may take somewhere from several weeks to months in the most demanding cases. It is not uncommon that patients who undergo full mouth rehabilitation treatment may require a large number of dental appointments. Full mouth reconstruction treatment is a commitment on the patient's part in terms of time. However your treatment can be staged in such manner that it minimally interferes with your schedule. The cost of full mouth rehabilitation can vary considerably depending on the treatment goals, and type and number of restorations. In addition to dental restorations you may also require other dental procedures such as root canal fillings, extractions, gum surgery and even implantation. These procedures as required, finally determine the cost of the entire treatment. One of the best ways to understand the cost of treatment is to set up a consultation where we can provide you a treatment estimate with the help of diagnostic x rays, digital images and study models.